James Stevens, principal, has built a thriving condominium and common interest community association and real estate practice on the twin pillars of experience and knowledge. Representing condominium and homeowners associations, James counsels clients in a wide range of both litigation and transactional matters. Among other concerns, he manages easement drafting, bylaws, declarations, developer turnover matters, enforcement litigation, collection of assessments and interpretation of governing documents. He also defends boards of directors in courtroom proceedings and advises clients on the Illinois Condominium Property Act, Forcible Entry and Detainer, Illinois Business Corporation Act, Not for Profit Corporation Act and Common Interest Community Association Act. In his real estate practice, James is a passionate advocate for his clients at all stages of the real estate life cycle, starting with development to ongoing management, deconversions and sales. From the pre-development vision to the property’s first day of business, James’ experience includes drafting and negotiating purchase and sale agreements, and drafting documentation to establish and develop condominium properties, distressed property redevelopment, financing and leasing. He also guides clients through bulk condominium deconversions—converting condominium buildings into rental apartments—the success of which hinges on the careful management of complex transactions, a thorough understanding of the Illinois Condominium Property Act’s requirements and constant energy pushing towards closing. 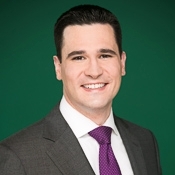 James also relies on his deep experience in community association law to advise lenders in secured lending transactions, providing counsel to lenders with careful analysis of association-related contingencies. The relational nature of practicing law is a large part of what James enjoys about his work. He appreciates developing an openness that invites clients to reach out whenever his help is needed, even after hours. James delivers intelligent counsel with a friendly, straightforward approach and works hard to give his clients good value for their money. He likes to make sure all parties leave the table with a complete understanding of the information they need to know in order to achieve their goals. In 2018, James was chosen by Leading Lawyers Magazine as one of the Top 100 Emerging Real Estate-Related attorneys in Illinois and he has earned the ranking of Emerging Lawyer for three consecutive years. Less than 2 percent of all lawyers in Illinois can receive this designation. James serves on the firm’s Marketing Committee and he is a past Board of Directors member for the American Constitution Society for Law and Policy, Chicago Lawyers Chapter. James and his wife travel as often as they can get away, enjoying time with family and friends, and opportunities to be introduced to a new language.